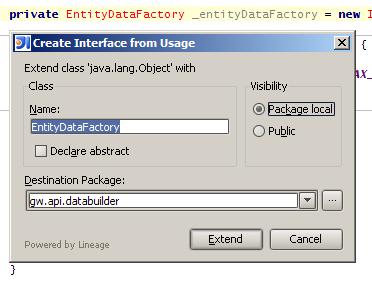 All of IntelliJ IDEA's class creation replaced with the improved class creation of Lineage. Now you can make a class abstract, static or specify its visibility at creation time and specifying the location where the class will be created is more flexible too. Use Lineage to extend and implement classes with more flexibility via the intentions or a keyboard shortcut. Lineage replaces the Create from Usage quick fixes with its own, so you can specify visibility, abstractness and location faster and easier. Paste classes into your project structure from examples found on the web or other external source files. The standard Create Class functionality has been expanded and improved. Extended Highlight Usages: Invoke it on an import keyword to see where in the file import statements are used. All features are accessible via the keyboard. Please try version 3.0.1 which I have just uploaded. Into your project. Copying directories from the file system or other directories will be supported in a later version of Lineage. Also note that copying directories currently not supported by the plugin. on a directory inside IDEA. Directory" is the first directory instead of the one for the current module. I've just tried Lineage 3.0.1 and found a problem. Interface A doesn't exist yet. If I place the cursor before "A" and pressing Alt + Enter, IDEA will show the action list (see the screenshot). After selecting "Create Class 'A'" and pressing Enter, nothing is created. 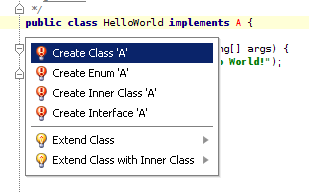 If I try Alt + Enter one more time, "Create Class 'A'" doesn't appear in the list anymore. Try to do the same process with "Create Enum 'A'", "Create Inner Class 'A'", "Create Interface 'A'", I find that they have same problem. abstract. Also, the Class box should say "Interface"
Thanks for the report. These issues are fixed in version 3.0.2 of the plugin. This will be fixed in a future version. Please try version 3.0.2 of the plugin. Your issue should be fixed there. After create a class, it will be better if the caret is placed after class name so user can easily enter "extends" or "implements". >> for the current module. >> Can this be fixed? This should now be fixed in 3.0.5.
class name so user can easily enter "extends" or "implements". and do indeed create classes. Thanks for the report. If you are using EAP version of IntelliJ IDEA Diana, a fix for this issue is available in version 3.1 of Lineage. I will release a version of Lineage for IntelliJ IDEA Selena sometime in the next couple of days.